Elevated above the surrounding landscape, Mt Quincan's forested slopes are a haven to relax and enjoy the scenic views. Our award winning retreat offers couples luxury, seclusion and privacy in a pristine environment surrounded by abundant wildlife and breathtaking views of the Atherton Tablelands. 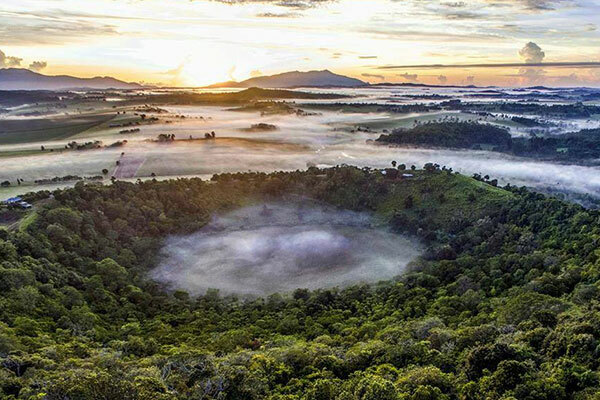 Situated in the heart of the Atherton Tablelands, the award winning Mt. Quincan Crater Retreat offers luxurious accommodation in architecturally designed pole cabins, nestled amongst some of Tropical North Queensland’s most breathtaking scenery. Our property has been specifically designed as a luxury escape for couples only. We strictly do not cater for children. The six architecturally designed cabins have been selectively placed in the rainforest on the slopes of the Mt. Quincan Crater to ensure you enjoy a private and relaxing accommodation experience. Listen to the peaceful sounds of the wildlife while you relax in your double spa. Snuggle up in front of the warm, rotating wood fire or enjoy the natural air conditioning during the hot summer months. Each fully self contained timber pole treehouse contains a luxury king size bed, comfy sofa lounge, double spa, and wood fire and of course there is the fully equipped kitchen where you will find the fridge stocked full country breakfast provisions for each day of your stay. Mt Quincan is home to an abundance of wildlife including 4 threatened species. Tree climbing kangaroos are regularly viewed from the treehouses. Just minutes from the scenic villages of Yungaburra, Peeramon and Malanda. Enjoy country markets, fine dining, arts & crafts, mountain bike trails, yoga studios, gem gallery and so much more. Mt Quincan is the perfect base for an Adventure or Eco get away, with such an abundance of natural splendour around us. If you are in need of a health retreat, this is the place! We can host yoga and wellness retreats, corporate getaways, specifically tailored retreats, all surrounded by amazing views, and natural serenity. Should pure relaxation in your ultimate hideaway become too much for you there is any number of outdoor activities. The retreat is situated on a 150 acre working Droughtmaster Cattle Breeding property, fenced off from the retreat of course.